A word cloud (or tag cloud) can be an handy tool when you need to highlight the most commonly cited words in a text using a quick visualization. Of course, you can use one of the several on-line services, such as wordle or tagxedo , very feature rich and with a nice GUI. 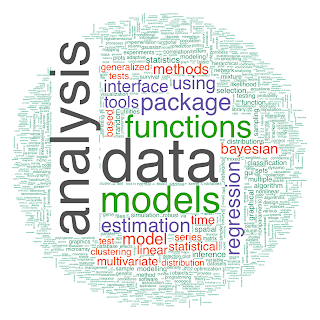 Being an R enthusiast, I always wanted to produce this kind of images within R and now, thanks to the recently released Ian Fellows' wordcloud package, finally I can! In order to test the package I retrieved the titles of the XKCD web comics included in my RXKCD package and produced a word cloud based on the titles' word frequencies calculated using the powerful tm package for text mining (I know, it is like killing a fly with a bazooka!). 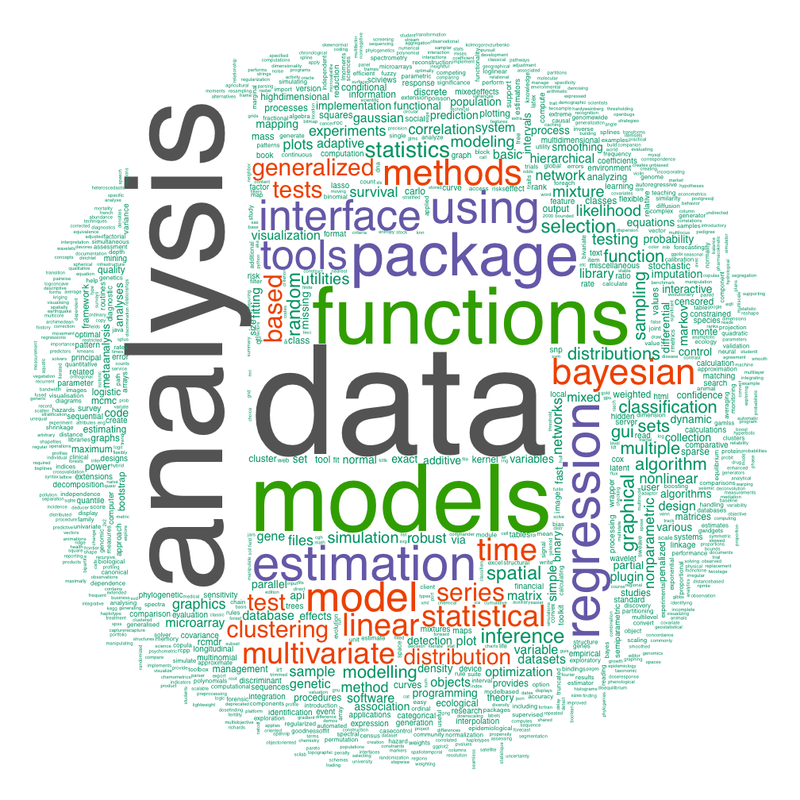 As a second example, inspired by this post from the eKonometrics blog, I created a word cloud from the description of 3177 available R packages listed at http://cran.r-project.org/web/packages. 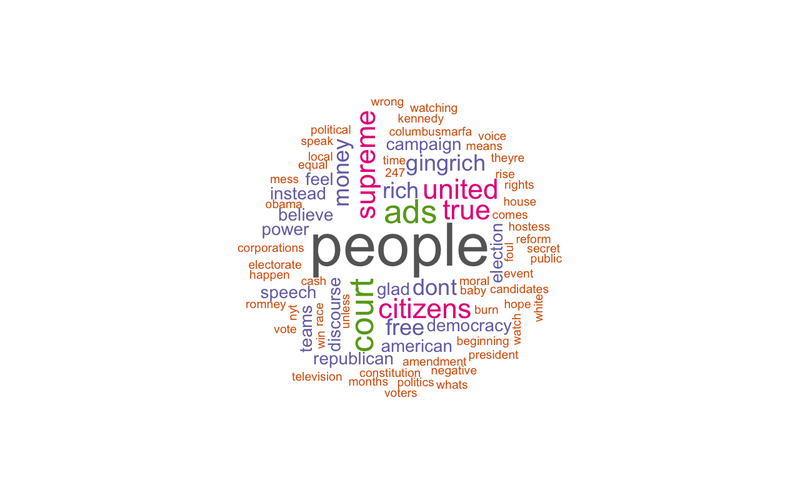 As a third example, thanks to Jim's comment, I take advantage of Duncan Temple Lang's RNYTimes package to access user-generate content on the NY Times and produce a wordcloud of 'today' comments on articles. Caveat: in order to use the RNYTimes package you need a API key from The New York Times which you can get by registering to the The New York Times Developer Network (free of charge) from here. my.key <- "your API key here"
The post is interesting and I could replicate your second example. But I don't know how to do it if I have a text in a txt file or a word file. Your example just works with a html table but very often we have whole texts. I will be very grateful if you can make a world cloud using a txt file. Thank you Paolo, I'm going to read about the tm package. This is my first meet with text mining bacause I just use R for my classes of statistics. I'm not a text mining expert as well but the tm package seems to provide a collection of tools that can be useful for solving both basic and more advanced problems in this interesting field. Very nice. Liked it and probably will use it. A great example. However sometime in the past two weeks back from 2011/11/30 the directory and file was removed. So "http://cran.r-project.org/web/packages/available_packages_by_date.html" is not found because the "packages" directory is no longer there. How about using another web site as an example? Thanks for the update! Feel free to suggest a web site of interest as an alternative. Thanks Paolo, this might be impossible but how about any text on a basic news web page like www.washingtonpost.com. Ignore pictures and pick phrases/sentences based on commas, periods and breaks "-". We could manually input a target web page and the example would wordwrap the page. Thanks Jim for your suggestion! I have updated the post in accordance with your advice (more or less). It seems that this problem (bug?) is related to the graphics device driver you decides to use (pdf, svg, png, etc.). I think that Ian Fellows, the author of the package, could answer your questions more appropriately than me! Thanks for stepping in. The RColorBrewer package allows users to access the beautiful and well conceived colorbrewer palettes from R, take a look at it! This sounds very promising. I didn't know that R let you create this kind of visualizations. I used wordle in the past, and R for a bioinformatic project at the University. I checked the code for the second example and it seems to work without a hitch. If you have used the exact same code presented in the post, the image should be generated in your working directory and named wordcloud_packages.png. I am a beginner with R. How can I create a "phrase" cloud? Basically I have a list of 100 strings/phrases which i want to present as a cloud. I have difficulty understanding the goal of your exercise. A word cloud is a visual tool which can help in perceiving the most prominent (frequent) terms in a collection of words using either color or size. In your case I can imagine your phrases are all different among them; therefore a representation based on frequency make little sense to me. The list of phrases has been derived based on importance; hence it is in order of importance. Is it possible to represent them like a cloud? How? Maybe give the phrases descending frequencies? More importantly, the examples above are for single words. What about phrases? 2) import or create a vector with the frequencies (convert your order of importance in same way to frequencies), e.g. See ?wordcloud. Take a look at min.freq and max.words arguments. hi this is good !! 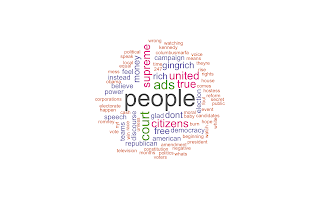 but it depends on word frequency,i will try on sentiment wordcloud along with frequency it means positive word show different color and negative one show different color.can any one help me. Hi Paolo, I was able to build word cloud from csv file with little modification of above code. Would like to know if it is possible to create different shape like what tagxedo provides? Dear Hari, from what I can see from the help page this feature is not currently available in the wordcloud package. You could suggest it to the author. I am using the package Word Cloud authored by you in R. The package creates a word cloud in a circle shape, would like to know if it is possible to make different shapes of word cloud like what tagxedo provides. I am not related to the author of this package nor have any connection with him. Error: failed to load external entity "http://cran.r-project.org/web/packages/available_packages_by_date.html"
I checked the code again and, with R 2.15.2 (on both Windows and Linux) and a recent version of the loaded packages, everything works as expected. Two suggestions: 1) check all the packages are installed and loaded. 2) Check your internet connection and firewall settings. Hi, I am using the latest version of R. I copy pasted your code in R but I am not getting any graph/World Cloud. I have installed all the required packages. Can you please help? Of course I can only guess but, from my experience, if both the installation of the different required packages and the sourced code didn't throw any error, this mean that the word cloud image was produced and saved in your workspace directory with the name wordcloud.png. The second example gives me a picture with black background as "Invalid Image". Pleas suggest how to get the image correctly for the word cloud. I am using the same example as mentioned. Using my configuration(Ubuntu Linux 13.10, R_3.0.1, current version of the different packages)the example works as expected. My guess is the device was not properly closed (i.e. you didn't type dev.off() at the end of the script). Dear Dhaval, csv importing is a very common starting point you have to do when you are going to use R or any other programming language for analyzing data. I suggest you to take a look at any introductory R book/tutorial you can find (see the R/CRAN website for tens of choices). Furthermore if you are still stuck at some point, you can get a lot of useful responses on the StackOverflow Q & A website (use the [r] tag). Can you help me to remove duplicates from one column using the tm_map (TM package) and corpus method? por que me sale esto? No easy solution: I checked on a Windows installation (R version 3.0.2) and everything seems work properly! Some advise: install the current version of R with all the updated packages required by the tutorial. I was trying to form the wordcloud for NYTimes community comments. What could be the reason beind this error? I have successfully obtained the API Key for NYTimes Community API. @Paicyclopedia I did manually some calls to the NYTimes API and they seen to work properly. Not 100% sure but it could be that the RNYTimes package is no more capable to use the API: you could ask the authors of the package to take a look at their code and see if it is really a problem related to the way the current API should be call from a wrapper. I got the same error as Paicyclopedia. I think the problem is related to the security level of your computer. It works. I have R-3.1.1 on Windows 8.1 64-bit. 0. I have installed RCURL. After the first start I deleted line 5. I have got the key for the Comment API. Great, thank you for these useful examples.